Ecuador’s new constitution recognizes “rights of nature” and peoples’ right to benefit from the environment and natural resources that enhance the Buen Vivir (Quality of Life). The national plan for Buen Vivir calls for spatial planning to guarantee territorial and global environmental sustainability, increase people’s safety by minimizing the impact of natural hazards such as floods. 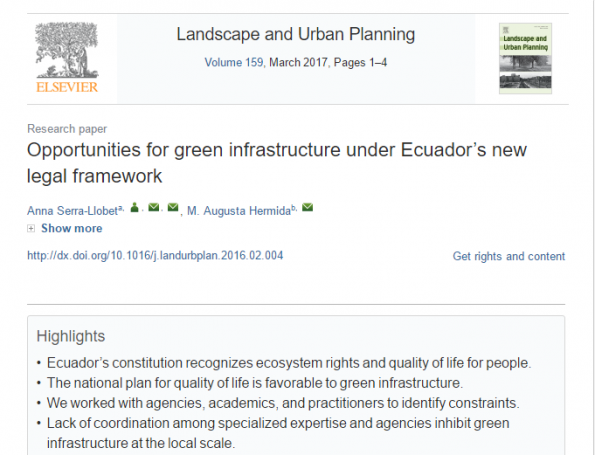 Within this context, we analyzed opportunities for green infrastructure in Cuenca (Ecuador’s third largest city). We mapped existing green areas and linkages, analyzed the roles of implementing institutions with structured input from 33 government, academic, and industry experts. We found that fragmented authorities and often-contradictory mandates of different agencies prevented optimal management of open-space areas within the city. Moreover, planning efforts within the city of Cuenca are completely disconnected from the rapidly-urbanizing peri-urban areas outside the city limits, resulting in missed opportunities for connected green space for wildlife, human recreation, and water quality benefits.